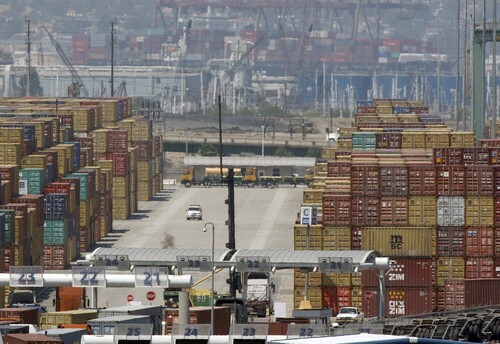 Imports at the Port of Long Beach, the nation’s second-busiest port, fell 18.6% compared with a month earlier. Overall cargo traffic is down 26.8% for the year. This according to a new report produced for the local ports but not released to the public. “It’s going to take a long time to climb up out of this,” said John Husing, an economist and cargo expert who has read the report. The comeback “is not going to look like a V, which would be an equally sharp recovery. It’s going to look like a very wide check mark.” Click the photo to the left to read the entire article from the Monday, August 17th, 2009 Los Angels Times. This entry was posted on Monday, August 17th, 2009 at 8:52 am	and is filed under Economy. You can follow any responses to this entry through the RSS 2.0 feed. Both comments and pings are currently closed.